Welcome to the Jackson Lodge! A wonderful rustic log home overlooking town. A perfect compliment to enjoy the Jackson Hole area for 5 or 6 weeks or the entire summer and/or winter tourist season. Our home is 3,000 square feet with an open and spacious floor plan to comfortably accommodate our guests. The entry level consists of two bedrooms (one with a king bed and the other with a trundle bed which sleeps two). This level also has a full bathroom and a laundry room. The main level is upstairs and includes the master bedroom (queen-bed), a full bathroom with a separate shower and jetted tub, a half bathroom, an office (with a loveseat/sleeper), an extra large and open family room, dining room, and kitchen. The loft area has a free weight gym set and a trundle bed, sleeping two more. We have a total of seven separate beds! The Jackson Lodge is decorated with high end furniture, antiques, antler art and beautiful wildlife mounts. There are plenty of windows to create a bright and airy feel and to also enjoy the wonderful mountain and valley views. 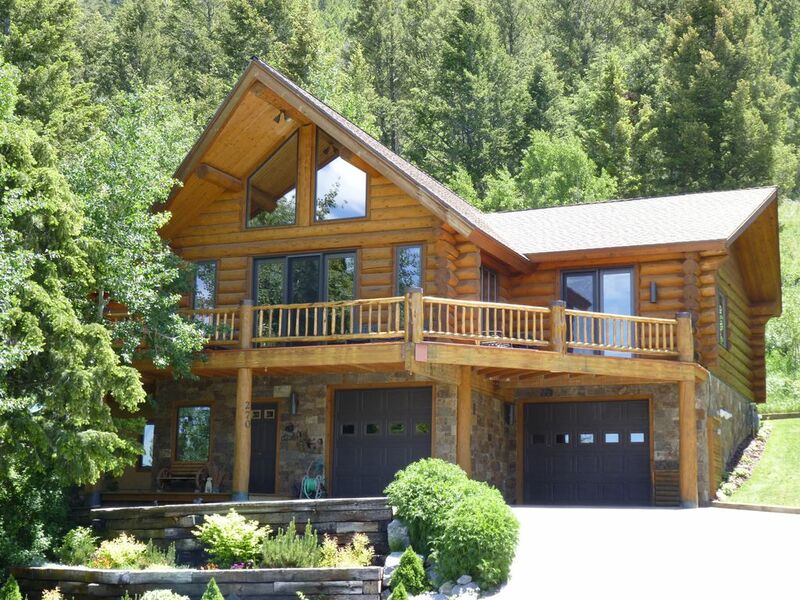 Located right in the town of Jackson (seven blocks from Town Square), just a short walk to Snow King Ski Resort (two blocks away), and only 12 miles from Jackson Hole Mountain Resort, this property is secluded, yet provides easy access to all of the amenities that Jackson Hole has to offer. You'll Love It! Roger and I live in Utah and have been married since 1994. I grew up in California, but have always had a love for the mountains. When Roger took me to Jackson Hole for the first time about 15 years ago, I fell in love with the town and all of the surrounding beauty. Jackson Hole became our favorite weekend escape. We never grew tired of the area and wanted the freedom to come and go as we pleased. Whenever we are up there, we have a very hard time leaving. We love our location! We feel the privacy and seclusion of being in a log home in the mountains, yet we can walk to the majority of the fun activities offered in town. In the winter, our home provides a wonderfully warm and cozy feel with plenty of windows. In the summer, our wrap-a-round deck allows us to sit comfortably in the sun or shade and to enjoy the view. Driveway Heater, wrap-around-deck, wonderful views of mountains and valleys, gym in the loft area, secluded location with walking distance of Jackson's Town Square.